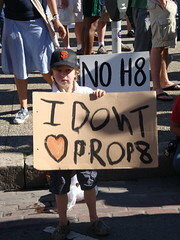 Proposition 8, a recent example of Californian direct democracy. Social media played a critical role in moving Egypt and Tunisia toward democracy by keeping people informed about protest movements and encouraging them to join. Yet a special report in The Economist this week about the dysfunction of direct democracy in California gives further evidence of how more democracy is not always better. When is democracy too much and how might digitally-assisted democratic processes be different than their analogue predecessors? California added the direct democracy processes of referendum, recall, initiative, and proposition to their constitution in the early twentieth century (see below). The initiative – called a proposition once on the ballot – is the most radical in that it allows citizens to make law that cannot be undone by the elected representatives of the legislature. It was an institutional change that greatly increased the power of citizen groups (and later individuals) to make public policy. As the report shows, this experiment in direct democracy has been a miserable failure for California. Elected representatives have little to legislate about since initiatives like Proposition 13 have tied their hands regarding raising taxes, and 70-90% of the annual budget has become non-discretionary. Like California’s direct democracy, digital activism is a result of a structural change in the political environment. In California, new politically processes were created as amendments to the state constitution, creating new political affordances and constraints. In the digital world, cheap and tremendously effective communication tools were built for economic reasons, but ended up creating political affordances and constraints as well. It in now much easier to share information globally and much harder to create an information vacuum. It is also much easier to track individual communication and much harder to maintain privacy. Though the sources of their power are different, both Californian direct democracy measures and digital activism have the effect of making citizens more politically powerful and more likely to successfully challenge government power. By making it easier for citizens to cheaply and easily share their political views with others, create relationships with like-minded people, collaboratively plan actions as a result of those shared beliefs, recruit others to the cause, and mobilize those supporters to action, digital activism also increases democracy in a very basic way: it makes the people – the “demos” – more powerful, the same intent as the California measures. A faction is not just a special interest minority but also a majority which seeks to dictate to a minority. Unfortunately, digital technology facilitates both. First, it facilitates the growth of cohesive minority groups as demonstrated by Nicholas Negroponte‘s theory of the “Daily Me”, Cass Sunstein‘s theory of echo chambers, and the “divided they blog” thesis of Lada Adamic and Natalie Glance in their 2005 paper on US political bloggers. Though the network can also break across group boundaries and increase mutual understanding and xenophilia, through trans-cultural communication methods like “bridge-blogging”, the fact that digital technology eases the creation of groups, which may have narrowly-focuses interests – remains a real problem. Even when digital technology brings together a majority, this majority may still not have the common interest at heart, as Madison noted. In this way, cyberspace suffers the same problem as California by increasing the power of special interests. Yet there is one way in which digital technology provides a different kind of democratic empowerment than state institutions: it largely decouples money from power. In the case of California, one of the great failings of the direct democracy measures is that their mechanisms – collect signatures, convince voters – can be achieved by hiring petition-management and marketing firms. In fact, lacking the money for such services, as would be the case of a true citizen initiative, would put that initiative at a significant disadvantage. In California, the mechanisms of direct democracy empower the super-rich. It is different in cyberspace, where near-free communication infrastructure means that the difference in influence between the the rich and the rest is much more muted. The influential voices online come from blogs and (in Egypt) Facebook groups. These platforms are accessible to anyone, and a mix of compelling message and good strategy can lead to influence even without money. Of course, this does not mean that the rich do not have influence over cyberspace. Cyberspace is populated by people, and these people consume multiple types of media and are the object of multiple online and offline influences. The overwhelming influence of certain special interests on cable TV and talk radio will seep into cyberspace through the content creators whose opinions they influence. It’s a complicated and highly intermixed media environment. As a structural change in the political opportunity structure, digital technology has a complex and often contradictory effect. While is soothes some political ills, like the communication power of the resource-rich, it exacerbates others, like the ease of faction creation. The final effect of digital technology on democracy is uncertain yet malleable. It is important that we better understand its current effects so that we can make interventions to nudge the political effects of the Internet in a direction that is beneficial for democracy.